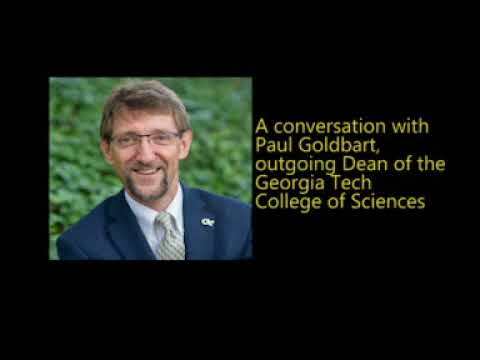 We continue our conversation with outgoing College of Sciences Dean Paul Goldbart as he reflects on his time at Georgia Tech and shares his thoughts on the college's opportunities for future growth. In 2017, Georgia Tech researchers were still celebrating the discovery of gravitational waves rippling through space-time when another celestial phenomenon captured their attention. College of Sciences Dean Paul Goldbart, who leaves us this summer to join the University of Texas at Austin, recalls the excitement over kilonovas and how they may be responsible for the gold in your wedding ring. In this second part of our conversation with Goldbart, he charts the rapid growth of the new neuroscience degree program, tells us where he sees future opportunities for the College of Sciences, and explains why science matters — not just on campus, but in many aspects of daily life. This audio news story also serves as a preview of ScienceMatters, the College of Sciences podcast coming in the summer. If you want to learn more about ScienceMatters, click here. Click at the image on the right to listen or read the full transcript below. Renay San Miguel: Hello. I’m Renay San Miguel with the Georgia Tech College of Sciences. We continue our conversation with Paul Goldbart, outgoing dean of the Georgia Tech College of Sciences, also the college’s Betsy Middleton and John Clark Southerland Chair. We taped this interview in February. With Paul’s appointment as the next dean of the College of Natural Sciences in the University of Texas at Austin, we’ve recast the interview as a two-part audio story serving as a valedictory for Paul, as well as a preview of our podcast “ScienceMatters,” coming in summer 2018. We left off with a discussion of how College of Sciences’ researchers were part of a Nobel Prize-winning effort to confirm the existence of gravitational waves, something Einstein predicted 100 years ago. 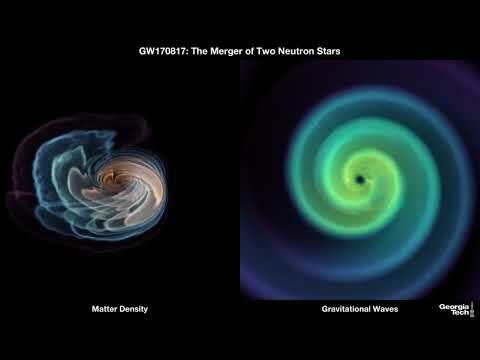 The first gravitational waves detected were the result of black holes colliding. It was a different kind of collision in summer 2017 that Georgia Tech’s researchers heard and saw while working with LIGO, or the Laser Interferometer Gravitational-Waves Observatories in Washington State and Louisiana. Here is School of Physics professor and LIGO deputy spokesperson Laura Cadonati, speaking in a 2017 Georgia Tech video. Laura Cadonati: On August 17, something special happened. For the first time, we detected a gravitational wave that was coming not from the collision of black holes, but from the collision of two neutron stars. A neutron star is what’s left after a star burns some of its fuel and implodes under its own weight. And this is going to give us important clues in where heavy elements are formed, how matter as we know it is formed, and which processes. Renay San Miguel: Again, here is College of Sciences Dean Paul Goldbart. Paul Goldbart: So if you take a cubic kilometer of Earth, it weighs about as much as a thimble full of neutron star matter, so incredibly dense. I believe if you were to take the sun and have it become a neutron star it would be about the size of the Georgia Tech campus. So incredibly dense matter and remarkable astrophysical objects. And every now and again, these are present in pairs out there in the cosmos orbiting around one another. 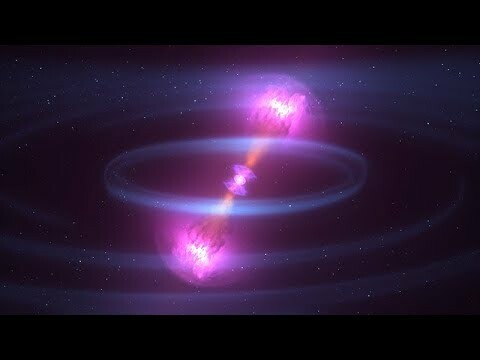 And in this event, two neutron stars rotated around one another, radiated out energy, and merged. And as they did, in this cataclysmic eruption of merger, which is called a “kilonova,” that was where nature manufactures roughly half of the heavy elements. So if I look now as I am at my wedding ring, it has gold in it, I believe. And that gold was almost certainly cooked, manufactured, through the collision of two neutron stars out there in the cosmos. Renay San Miguel: Tell me about some of the disciplines that are offering some exciting potential for scientists and researchers here at Georgia Tech. You talked about astrobiology. What other research are you wanting to keep an eye on here in the future? Paul Goldbart: Yes, let me tell you a little bit about neuroscience. Neural engineering at Georgia Tech has been a growth field for a number of years and is doing very well. It has an international reputation, very strong. We have also begun to grow in neuroscience—neuroscience as opposed to neural engineering, although as with many science and engineering disciplines, there’s a great deal of overlap; a very soft zone separating them. So we’re delighted, in fact, that we have a tremendously strong community of neural engineers here at Georgia Tech. I’ll tell you a short story: About four years ago or so, my colleagues in the College of Engineering dropped by the College of Sciences to say, “Hello.” I’d been dean for a few months. And we sat down, and they chatted, and they said we should have a neuroscience degree. And I thought about it for a little while, and I thought, they’re absolutely right. And I went to see Associate Dean David Collard, and we discussed the idea and both of us agreed that this would be a marvelous step forward. Tremendous campus support, tremendous campus enthusiasm, we’ve been hiring neuroscience faculty to complement the neural engineers and build a really thriving and broad community of neural researchers here at Georgia Tech. Let me emphasize: That was not my idea. That was already running, well before I became dean. And it’s really been doing very well with great campus support.And the centerpiece of this step forward is the creation of a neuroscience bachelor’s degree at Georgia Tech. And so until the summer of 2017, if one wanted to study neurosciences in undergraduate, much as we would love to have you, Georgia Tech was not the place for you. It is now! And I have to say I’m tremendously excited, and we are finding that students are wildly enthusiastic about this new major. And it’s actually quite a delight to construct a major after they have been constructed at other places, as you can look around and you can think and you can really focus on the future. So I think we’ve caught it just right: great neuroscience but also neural technology options built in so that you really can train yourself as an undergraduate to be a neuroscientist of the future right here at Georgia Tech. Renay San Miguel: And it’s my understanding you expected a certain amount of interest in the first year of the program, but you exceeded that. Paul Goldbart: We certainly did. We certainly did. So the numbers are somewhere like 150 students in the first cohort, and that is marvelous, and the more the merrier. Of course, growth like that brings the occasional strain, but those are the strains that every dean loves to have. No complaints from me. Renay San Miguel: The name of the [forthcoming College of Sciences] podcast is “ScienceMatters.” Tell me why all of the science and research that we’ve talked about here so far, why that matters. What’s in it for all of us? Paul Goldbart: Yeah, so there’s a tremendous amount in it for all of us. Let me start with the obvious. So the obvious is that science brings new understanding, and new understanding brings new capabilities and new power for humankind to control, and work with, and adapt and manipulate, ideally for sound, solid, good purposes, the world around us. And so science has given us tremendous opportunities to do that. — and it’s not very long ago. And so the same with vaccinations — vaccinations are tremendously important. Let me take the example of weather forecasting. A hundred years ago or so, catastrophic weather events in the city of Galveston, but all around the world and throughout history, we’re now in a situation where we may not be able to forecast weather with the kind of precision that any naysayer might choose to impose. But the fact is we are saving human lives; we are saving property by the millions of people per year and improving the human condition through that. Now how does it come about? It doesn’t come about just by focusing on weather. It comes about by handshaking between all sorts of disciplines. So without the understanding that silicon, in fact, is a semiconductor, we wouldn’t be in the situation of having solid-state circuitry and high-speed computers. And without beautiful ideas in applied mathematics, we wouldn’t be in a position to take accurate solutions of the complex nonlinear equations that describe the patterns of weather. Without electromagnetics, we wouldn’t have ultra-fast communications. And so this handshaking of the web of understanding of the way the world works comes together and helps move forward to really change the human condition. Of course, that happens perhaps nowhere more importantly than in the fields of medicine where, across the board, one is confronted by examples in which it’s scientific understanding that has provided one, not all, but one of the keys to forward progress. The example that I often like to cite is the laser. Lasers have had an amazing impact in eye surgery. I have friends who are ophthalmic surgeons, and they’re brilliant and I really appreciate them, but I don’t think any of them would have come up with the laser. And so it’s this handshaking, this relationship, between the international web of science, international in space, but also going back in time, that has given human kind a sense of understanding, an ability to control, an ability to manipulate the world around us in terms of matter and energy; that is incredibly empowering. But I want to take it one step further if you don’t mind, Renay. I would like to argue, and I believe this quite deeply, that although science is not in a position to solve all our problems by any means — there are complex cultural and social and political problems that are challenging and hard to address, and I wouldn’t want to argue that all you need is a scientist to address them by any means — but I do think that we provide a model for how to think about and make progress with complex problems. And I think the reason is that the scientific approach to problem solving has found a rather elegant and powerful balance between, on the one hand, reason, on the other hand, data, and on the other hand, third hand, creativity. And it’s this kind of intersection between all three together with the ability to let go of ideas that no longer seem to work and happily move on, that I think gives science not only its power in its own domain, but also serves as a great exemplar to the way that we, human beings, can address some of the deepest and most challenging issues that we face in economics and in politics and public health, so forth. And I’ll also say that you may think of us, we scientists, as people who sit and solve complex equations. And we do do that from time to time. But actually, what we really do is construct cartoon pictures of the way the world works in our heads or in our notebooks or on the chalkboard. And then what we do is make what we call back-of-the-envelope estimates: We sit down and we just ponder and reflect and put together the different pieces of scientific understanding and we make simple estimates — “Do I need a field that has the strength of one gauss to do this experiment, or do I need a field a million times bigger?” I need to know that before I consider the experiment or propose it to a funding agency. So what we do all the time is make these estimates, and we get a feel for things. And that way of thinking, I think, is enormously empowering. I’ll call it semi-quantitative reasoning, and it’s something that I think we really need to advertise and propagate out into the world. Just as an example: if I’m thinking about, let’s say, a topic like employment, I need to have some feeling for the numbers: What fraction of people are out of work? What fraction of people are looking for work? How many new jobs were created over the past eight years for example? So one has to have a kind of framework, a kind of feeling for numbers and relationships between them before one really seriously enters into arguments. And that way, one’s steered away from dogma and towards the light and that, I think, is what science can help us do. Renay San Miguel: Given what you’ve just talked about here since you’ve been here at the College of Sciences, what about your vision for the future here? How do you want to grow this college over the next, let’s say, five years? Paul Goldbart: Yeah. So in my first five years or so as dean, we focused on many things including strengthening the infrastructure under which people can undertake research, building up tremendous capabilities in nuclear magnetic resonance and mass spectrometry and other areas, too, and I think that’s been great. We’ve also built facilities that people share and that creates community and promotes interaction. So I think we’ve supported the research endeavor with partnership with the campus well and I’m pleased with that. We’ve also, I would say, we’re beginning to figure out how to create the best platforms for early-career scientists to learn how to navigate the complex web that is an academic life rather than leaving them to their own devices, but also without a heavy hand so we don’t too strongly influence the research that they choose to do. We are trying to find the middle ground to lift people up and really elevate the prospects for really great success. I think we’ve also had an impact on the scale and energy in the undergraduate programs. We’re really in a marvelous partnership with the campus to increase the fraction of science majors and math majors at Georgia Tech from about 10 percent aiming for something like 20 percent just to give a kind of balance to the Georgia Tech community, and that’s coming along, I think, really well. Looking forward to the next five years, I think for the college, one of the key objectives is to grow and strengthen the graduate programs. One of the reasons for this is that the reputation that we have worldwide and the impact, more importantly, that we have worldwide comes to a considerable degree from the quality and quantity of the research that we produce, and that signal is quite strongly carried by the people who we’re fortunate to train, and so by having an even stronger and even larger graduate program, we will be sending out into the world these marvelously trained, exciting, and thoughtful people who are carrying with them the Georgia Tech seal out into the scientific and mathematical worlds and carrying our story with them. And so from my perspective, I think growing the graduate — growing and strengthening the graduate program is a key to our future success. Renay San Miguel: That was Paul Goldbart, dean of the Georgia Tech College of Sciences until the end of July. In August, Paul will take the position of dean of the College of Natural Sciences in the University of Texas at Austin. We wish him the best, and we thank him for his extraordinary work here in midtown Atlanta. I’m Renay San Miguel with the Georgia Tech College of Sciences.